43' Ketch - Iron sick hull. Too far gone? This is a 1943 Ketch. 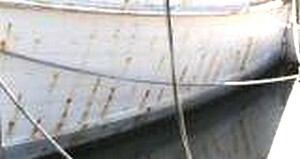 At a minimum, she will need to be 75% refastened (yellow Pine on steam bent oak frames), some planks, (or many), new transom, side deck beams, decking, etc. She has been a lived aboard for the last 10 years. What's the worse case here... $100k? It belonged to my Dad 40 years ago and I'd like to bring her back if possible. I know I know... bad idea, but I love this boat. Comments for 43' Ketch - Iron sick hull. Too far gone? There's not much I can add to Larry's comment. There are some things you can't put a price on. On the other hand, once you start it would be a shame not to be able (financially or otherwise) to complete the job. Unfortunately the cost will depend on so many unknowables until she is out of the water and you begin to probe. And it will depend on where you are going to restore her, how much of the work you can do yourself etc, etc. But the fact that she is still afloat after all these years says a lot for the old girl. How far is to far is best decided by your abilities and your checkbook. She sounds like a great peace of history, as well as a peace of your family. Keep in mind that they can always mold more plastic boats, but once these great old woodys are gone, we loose an important part of our history and lifestyle. If possible, please don't let this get converted to firewood.